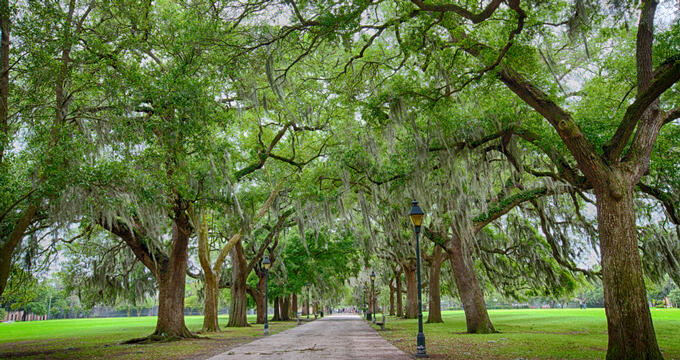 Many of Savannah's historic sites can be strolled through for free at any time of day or night, home to majestic statues, beautiful fountains, and urban green spaces. For low-cost transportation throughout the city, visitors can ride the Chatham Area Transit's bus system or catch a unique free Savannah Belles Ferry to nearby Hutchinson Island. 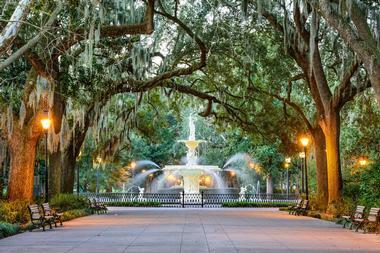 Forsyth Park is a 30-acre urban public park in Savannah's historic district, originally developed on 10 acres of land in the 1840s that was donated to the city by William Hodgson and significantly expanded in 1851. The park is known internationally for its Forsyth Fountain, which was constructed in 1958 to mimic Peru's Place de la Concorde fountains and has been featured in motion pictures such as Cape Fear and The Longest Yard. Other attractions at the park include a Confederate Memorial, an outdoor theater, a cafe, children's playgrounds, and courts for tennis, soccer, bocce, and basketball. Each Saturday, the park hosts the city's farmers' market, and each St. Patrick's Day, its iconic fountain is ceremonially turned green to honor the city's Irish residents. 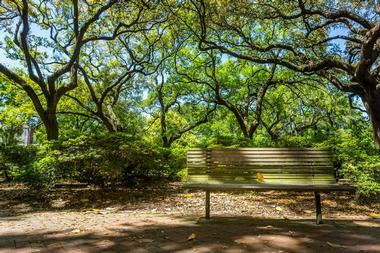 The park is also host to an annual free movie series and the yearly Savannah Jazz Festival. 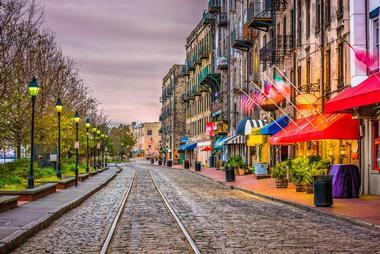 River Street is a bustling shopping and arts district along the Savannah River, showcasing businesses housed within converted cotton warehouses from the late 19th and early 20th centuries. More than 70 businesses line the district, including over two dozen casual and upscale restaurants offering a wide variety of cuisine options. Beautiful art galleries, hip and elegant boutiques, and antique stores also line the district, along with brewpubs and vibrant nightlife spots. Public art abound throughout the district, including the Olympic Torch Sculpture, which was constructed in honor of Savannah's hosting of the yachting events at the 1996 Atlanta Summer Olympics, and the iconic Waving Girl Statue, transplanted from Elba Island. 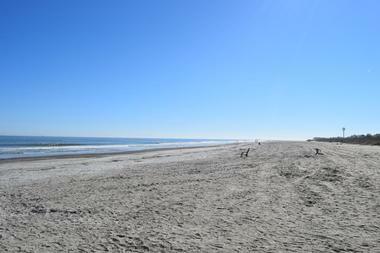 Tybee Island is a barrier island and coastal community located 18 miles off the coast of Savannah, consistently ranked as one of the United States' top beach sites. Historic sites abound on the island, including the Tybee Lighthouse, which was originally constructed in 1732 and has been in operation for more than two centuries, considered to be one of America's most intact historic lighthouses. The free-admission Fort Pulaski National Monument preserves the historic military fortifications of the same name, while the Cockspur Lighthouse on nearby Cockspur Island showcases an historic 1855 lighthouse tower. 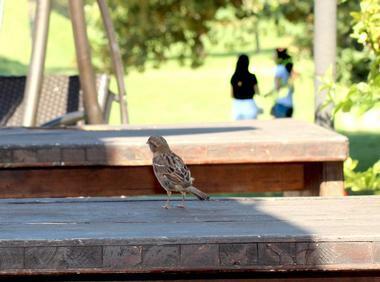 Other attractions include the Tybee Pier and Pavilion, a popular fishing spot and community gathering space, and the McQueen's Island Trail, spanning six miles and offering opportunities for wildlife watching. Calhoun Square is a public square that was plotted in 1851 and named in honor of Vice President John C. Calhoun, a former senator from South Carolina. Today, it is Savannah's only public square that features all of its original intact buildings, home to beautiful Greek Revival-style historic homes and businesses. Visitors can view historic landmarks in the square such as the Massie Common School House, constructed in 1856, and the imposing Wesley Monumental United Methodist Church, which features beautiful Gothic architectural elements. A Slave Cemetery features notable burials of Africans brought to the Americas as part of the Transatlantic Slave Trade. Other landmarks include Clary's Cafe, considered to be one of Savannah's best breakfast joints. Ellis Square is one of Savannah's three "lost" public squares, originally designed in 1733 and demolished in 1954 to make way for the development of a parking garage. In 2005, thanks to the work of citizen activists, the square was restored to its original 18th-century configuration and is now home to popular public attractions such as a children's water fountain and jet plat area and a life-sized chess set. Visitors can rent CAT bikes at the entrance to the square's City Market and can relax at shaded tables throughout the square. Popular restaurants near the square include the Goose Feathers Cafe and the Lady and Sons Restaurant, operated by celebrity chef Paula Deen. Colonial Park Cemetery is one of Savannah's most historic public sites, originally constructed in 1750 to house the interments of Savannah's earliest settlers, including victims of the city's 1820 yellow fever epidemic. Though its origins are doubtful, local legend recounts that many of the cemetery's gravesites were altered by Union Army soldiers during the American Civil War, with dates changes and graves exhumed. Around 1850, the cemetery fell into disuse following transfer of public interments to Laurel Grove Cemetery, but famous burials still remain, including Declaration of Independence signer Button Gwinnett. 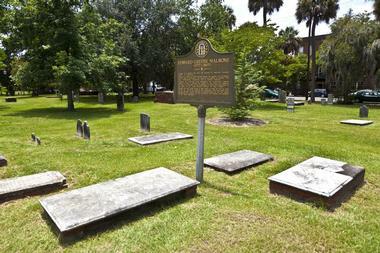 Visitors can explore the cemetery, which is reported to be one of Savannah's most haunted sites, during daylight hours. Pulaski Square is one of the later-developed public squares in Savannah's unique grid layout system, originally designed in 1837 and named in honor of 18th-century freedom fighter General Casimir Pulaski. The square is located at the intersection of West Macon, Barnard, West Harris, and West Charlton Streets and features historic structures such as the home of Confederate Army hero Francis S. Bartow, the first high-ranking Georgian soldier to die in the American Civil War. 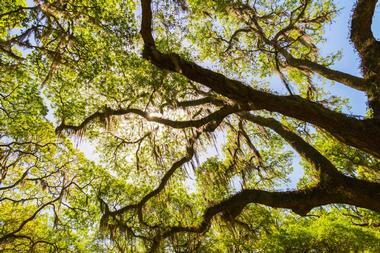 Beautiful live oak trees line the square, with lush ivy groundcover dotting its landscape. Italianate and Greek Revival-style architecture is on display throughout the square, including row houses and unique five-bay houses. 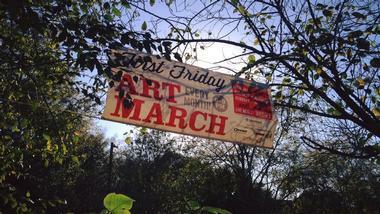 First Friday Art March is a monthly art gallery event held in Savannah's Starland and Victorian Districts, presented on the first Friday evening of each month. Visitors can explore the districts as part of self-guided walking tours and visit art galleries, studios, and boutiques that participate in the event between 6:00pm and 9:00pm. Many galleries present opening-night receptions and offer complimentary wine and refreshments, with restaurants and bars in the districts offering specials and discounts the evening of the event. Live entertainment is presented at an open-air vendor market, which showcases the works of local artisans. Visitors can hop aboard the Old Savannah Tours Trolley for free throughout the event, which runs approximately every 20 minutes. 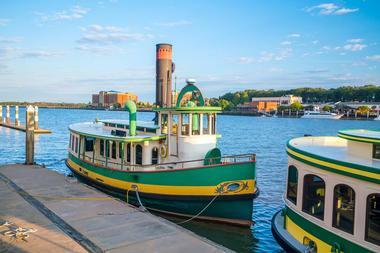 Savannah Belles is a free passenger ferry that connects the city's downtown district with nearby Hutchinson Island, which is home to the Savannah International Trade and Convention Center. The ferry service is named in honor of the city's historic "Belles," with four ferries named after Girl Scout founder Juliette Gordon Low, Civil War nurse Susie King Taylor, "Waving Girl" Florence Martus, and indigenous interpreter and negotiator Mary Musgrove. Ferries operate seven days a week between 7:00pm and 12:30am, with landings offered at the Trade and Convention Center, Savannah's City Hall, and Morrell Park. All ferries are ADA accessible, with well-behaved dogs on leashes permitted aboard. 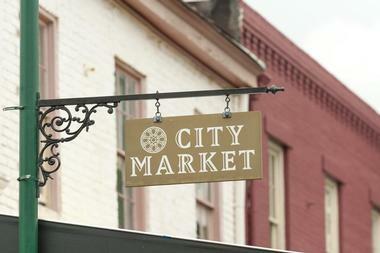 Savannah City Market is a four-block 18th-century open-air market in Savannah's Historic District that has served as the city's historic center for centuries, surviving the Civil War, a major 1896 hurricane, and two major fires. The market has been preserved as an historic landmark today, housed within restored warehouse buildings that offer a wide variety of shopping and dining options. Restaurants and food vendors within the market range from British bakeries and seafood houses to daquiri dispensaries and ice cream shops, while vendors include local artists working a variety of mediums and home and decorative goods designers. Upstairs, the market's Art Center showcases the work of more than two dozen regional artists in a 19,000-square-foot loft gallery space.